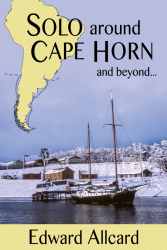 Imperator Publishing are proud to announce the release of cruising pioneer Edward Allcard’s latest title, Solo around Cape Horn – and Beyond…, about his adventures 50 years ago in Patagonia and Tierra del Fuego. 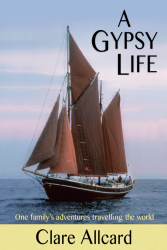 Simultaneously we are re-issuing Allcard’s wife Clare’s classic A Gypsy Life, an account of the couple’s later cruising adventures. When Edward Allcard sailed south from the River Plate in 1966, he was heading into a territory which was almost entirely unknown to yachtsmen – and cruising in the high latitudes was a very much more challenging and dangerous business in the days before sailors had access to weather forecasts and to electronic navigation equipment. As a single-hander, Allcard often had to spend an entire day or night at the helm. Heavy weather challenged not only his own endurance but also that of his elderly wooden craft. There were times during the voyage to Cape Horn when the duo seemed to have met their match, and Allcard certainly came perilously close to losing his boat and his life. But with his passion for the wild Patagonian scenery and anchorages, his encounters with the fast vanishing pure bred Yaghan Indians, and his foraging ashore for food and firewood, his escapade lived up to all his expectations. Clare Allcard and her husband, Edward, have dared to live a life that armchair travellers can only dream about. With their small daughter, Katy, and a constantly changing crew, they spent twelve years aboard the Johanne Regina, the 69 foot Baltic Trader they found rotting in the West Indies. After cruising the Caribbean, the Allcards crossed the Atlantic to Europe and tracked down Johanne’s origins in her Danish home port before setting off around the Mediterranean and through the Suez canal to ‘The Ants’ Nest’, their palm-thatched hut in the Seychelles. On the way they were rammed by a French fishing boat, raided by the Italian Mafia, attacked by the Ethiopian Navy, and captured and jailed for spying by the South Yemenis. Between times, in remote ports around the world, they struggled to rebuild their boat and educate their daughter. With Clare’s vivid and evocative writing illuminating their travels and providing intriguing insights into the family’s adventures, you don’t need to be a sailor to enjoy this lively and entertaining travelogue. For our other titles, please visit our catalogue. We welcome proposals from authors writing in various fields.